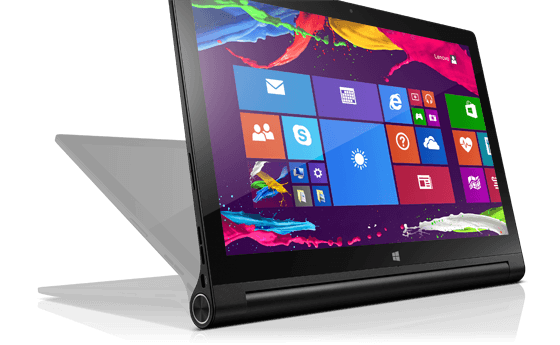 Lenovo had widen Yoga series with yet another launch of Lenovo Yoga Tablet 2 with Window 8.1 as operating system. Earlier this month, Lenovo has expanded launched 13.3-inch Yoga Tablet 2 Pro with Android OS, 10-inch and 8-inch Yoga Tablet 2 with variant in OS i.e. Window and Android. This Tablet will be running on Windows 8.1 as its OS and price tag against it is $ 699. It will land the shelves till November. Apart from the Yoga Tablet 2 Pro, it does not include Pico projector which can project an image to 50-inches of size on any surface. It will be along with Keyboard cover with Microsoft office 365 with a trial period of a month. It will be available with stand which will make it easier to use in any position as it will rotate upto 180 degree and can be used in four different mode i.e. Hold, Hang, Tilt and Stand. On the specification front it Display screen size of 13.3-inches QHD display with a resolution of 2560 * 1440 pixels, and is powered by 1.86 GHz Intel Atom Z3745 processor. The battery life will be of 15 hours. For its sound, it has been loaded with JBL stereo speakers and subwoofer. Connectivity includes Wi-Fi, Bluetooth, Micro-HDMI and Micro-USB. The differences which separate it from Yoga Tablet 2 Pro are it has been coupled with 4 GB of RAM, built-in memory of 64 GB, which can be expanded via microSD card upto 64 GB. Pico projector has been missing from it. It has a front camera of 1.6 MP with no rear camera. With keeping in view of International Festival, Lenovo is trying to make available all variants of Tablet which the user can go. It is good to make products available in different variant of OS. The two wide OS used in Tablets are Android and Window and every manufacturer is coming with their best. Though, the products of Lenovo are universally accepted worldwide and as per My Tablet Guru past experience, the Tablets of Lenovo always keep on buzzing.